Yuba City Cinemark theatre bans Sikhs wearing kirpans from seeing "Punjab 1984" opening! 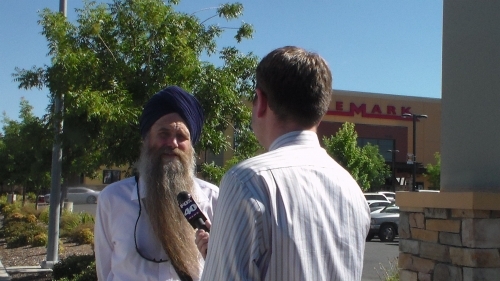 Be sure to watch coverage of this Sikh kirpan issue on Fox 40 TV Sacramento tonight at 10 PM. I am a Sikh. My faith -- which stems from India -- is acknowledged as one of the world's major religions (there are 23.8 million Sikhs and only 13.4 million Jews). We stand out because baptized, male Sikhs wear turbans, beards and uncut hair as a sign of their faith. If you see a man on the street with a turban and beard anywhere in the USA, it's almost certain that he is a Sikh. The tragic events of September 2001, plus the torrent of publicity about Osama Bin Laden, led to enormous difficulties for Sikhs in the USA. On September 15, 2001, one Sikh was shot dead in Phoenix. On Sunday, August 5, 2012, a lone gunman walked into a Sikh Temple in Oak Creek, Wisconsin and began deliberately shooting at the congregation, killing six and wounding two. These incidents were caused by mistaken identity: mistaking Sikhs for Muslims. Sikhs are not Muslims and have no relationship with Islam. In fact, as Sikhs, we are enjoined to be tolerant and accepting of all other religions. It is a vital part of who we are. In 1699 Guru Gobind Singh, the 10th Sikh Guru, gave us a unique form. As part of my identity as a Sikh I am required to keep five symbols of my faith. I keep my hair and beard uncut, I wear a special undergarment, I wear a small wooden comb in my hair and a steel bracelet on my wrist. And I carry a small ceremonial knife, called a kirpan. The five articles of faith signify my commitment to my faith and to the highest ideals of love and service to humanity. These symbols unify and bind myself and other Sikhs to the beliefs of our religion. They are a daily reminder that we must live an honest, moral, kind, brave and loving life. It is understandable that most people would characterize the kirpan as a knife or sword. Yet for me, the kirpan is a mandatory article of faith that obligates me to the ideals of generosity, compassion and service to humanity. It acts as a constant reminder to me of my solemn duty to protect the weak and promote justice for all. Like most other Sikhs, I keep my kirpan -- which has a blade length of four inches and is dull -- in a tight sheath suspended at my waist. Recently I was called for jury duty at Sutter County Superior Court in Yuba City, California. I contacted the court and asked them about my kirpan. They made it very clear that I would not be allowed to enter the courthouse unless I removed it. I explained that it was a duty of faith for me to wear it and that I should be given an exemption on religious grounds. Because the kirpan is a religious article of faith, Sikhs' right to freely wear their kirpans is consistently protected in the United States. Courts and prosecutors around the country have without exception respected the right of Sikhs to practice their religion by wearing the kirpan. There have been over thirty separate cases where Sikhs were arrested and criminally charged by police officers for carrying a kirpan. Every case has led to a voluntary dismissal of the charges by a prosecutor or, in two instances, dismissal by a court. Consistent with these cases, multiple U.S. federal entities have granted Sikhs accommodations to wear kirpans in federal buildings. The U.S. Department of Justice's Community Relations Service (CRS) has gone to great lengths to educate law enforcement officials throughout the country about Sikhs and the religious significance of the kirpan.